Posted Friday, March 26th, 2010 by Steve Leigh. Pitney Bowes has created a line of printers specifically designed for printing addresses on envelopes at a rapid speed with consistency and quality. 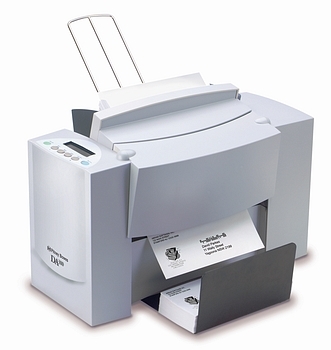 These machines range in size, with the smaller models meant for offices with occasional addressing needs and the largest model equipped to handle thousands of pieces of mail per day. The series line is called AddressRight, and though these are not the first machines of this type, Pitney Bowes has certainly raised the bar. Does your office print and send hundreds of invoices per day? The time and manpower it takes to process every single envelope is overwhelming, not to mention the inevitable human error. These address printers from Pitney Bowes remove these factors from the process. Accurate, clear and reliable, the AddressRight printers will provide unyielding consistency. 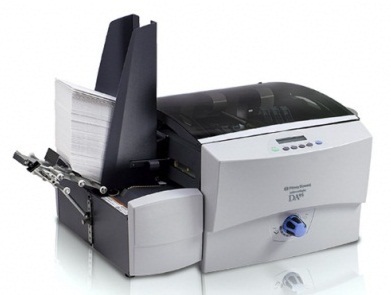 From the DA300 (pictured on left) that can print up to 4,400 addresses per hour to the DA95f (pictured on right), which will address as many as 30,000 mail pieces in an hour, the AddressRight model line will make an impact to any office that requires this service. The printers will pull addresses from an address list on the computer and print rapidly on the envelopes. Pitney Bowes makes various pieces of equipment designed to make mail-related tasks easier to do and the process more efficient. As their slogan reads, “Engineering the flow of communication”. You will be able to find machines that print bar codes and postage, fold documents in various ways, even ones that sort, stuff and seal envelopes. Visit their website to explore the innovative mailing systems being developed that could benefit your office.